The second earliest view of Minneapolis. Seen from the roof of the original Macalester College campus. A stunning 1874 chromolithograph view of Minneapolis by George H. Ellsbury and Vernon Green. 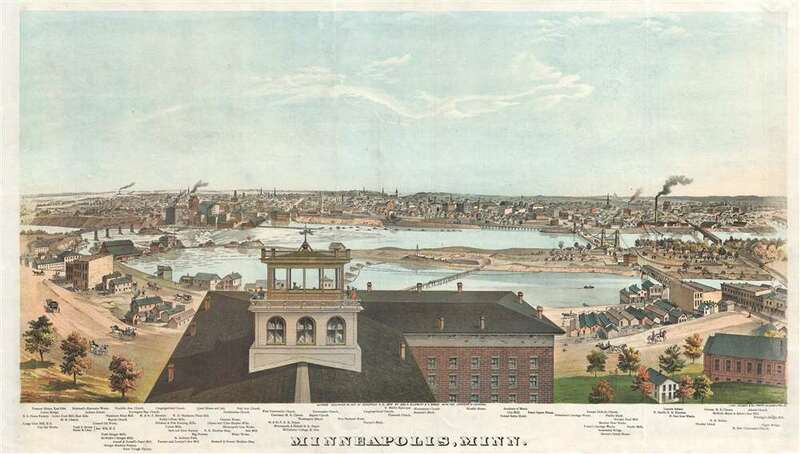 This image is the second earliest specific printed view of Minneapolis, following only the Hageboeck view of 1872. The view looks westwards over the Mississippi River towards Minneapolis. The large building in the foreground sporting an angelic wind vane is the observation tower of the Winslow House Hotel, which in the year this view was issued became the founding structure of Macalester College. The original span of Hennepin Avenue Bridge can be also seen crossing the river from Nicollet Island – this is the first permanent bridge over the Mississippi River. Eighty-five additional structures are noted beneath the view, including churches, mills, factories, municipal buildings, and hotels. The view is somewhat non-traditional for the period, reflecting Ellsbury's unusual approach. Rather than take a bird's-eye perspective, as was then common, Ellsbury preferred to draw his views from a slightly elevated perspective, producing long panoramic foregrounds with distinctive elements, including, as with the present view, breakwaters, industrial activity, piers, and more. The whole presents the impression of a city on the rise, as Minneapolis of 1874 most assuredly was. This view was drawn by George H. Ellsbury and Vernon Green, both then of Minneapolis. It was lithographed and printed in Chicago by Charles Shober, then of the Chicago Lithographing Company. The map view was both separately issued and included in the deluxe edition of A. T. Andreas' An illustrated historical atlas of the State of Minnesota. All examples are rare. George H. Ellsbury (November 29,1840 - September 3, 1900) was a Minneapolis, Minnesota based sketch and view artist active in the second half of the 19th century. Ellsbury was born in Skaneateles, New York, in 1814. His family moved to St. Charles, Minnesota in 1857. In 1862, when the American Civil War broke out, he enlisted with the 7th Minnesota Volunteers and saw action on the southern front, eventually attaining the rank of colonel. During the war, he drew a number of battle and camp scenes for Harper's Weekly. After the war, he participated in the General Alfred Sully and General Henry Hasting Sibley Expeditions (1863 – 1864) to the Dakotas and published many of his drawings from the expedition in Frank Leslie's Illustrated Newspaper. Around 1866, returning to Winona County, Minnesota, he was elected as the County Register of Deeds and married Julia Curtis (1827 – 1926). Also, around this time he completed his historic perspective views of Winona, St. Paul, and Minneapolis. Ellsbury later moved to Cass County, Dakota, where he founded Tower City and was part of the fledgling Dakota Southern Railroad Company. In 1888, he moved to Centralia, Washington as a land agent. There he started the Tacoma, Olympia and Chehalis Valley Railroad Company, the Tower Lumber and Manufacturing Company, and Florence Coal Mines. Following a long period of heart and kidney disorders, he died in Centralia on September 3 of 1900. He was given a masonic funeral rite and interred at Washington Lawn Cemetery. Ellsbury was survived by his wife, two sons, and two daughters. Vernon Green (fl. c. 1860 – 1880) was a Minneapolis based viewmaker and artist active in the late 19th century. Green published views of Minneapolis, St. Paul, Winona with George H. Ellsbury. Charles Shober (February 1831 – 190?) was a German-American printer, publisher and lithographer based in Chicago, Illinois. Shober immigrated to the United States from Germany in 1854, already a trained lithographer. His first lithograph in America appeared in an 1855 issue of The Horticulturist. He quickly established his business in Philadelphia and was listed in the 1856 city directory as a lithographer based at 17 Minor Street. In 1857, he partnered with Charles Reen to form Reen and Shober, located at 5 South Sixth Street, Philadelphia. Following the railroad boom, the partners relocated to Chicago where their joint business dissolved. Shober struck out on his own, publishing a map of Ypsilanti in 1859. Shober operated in Chicago both independently and in a variety of short lived partnerships until the Great Chicago Fire of 1871. After the fire, he took over management and partial ownership of the Chicago Lithographic Company, which had been founded some years earlier by Louis Kurtz and Edward Carqueville. Kurtz left the business in 1876 and the company was renamed Shober and Carqueville. Despite infighting, the firm prospered by issued views, posters, maps, trade cards, and sheet music. Carqueville and Shober both took on additional partners and battled over the ownership of the company until it was dissolved after a devastating explosion and fire in November of 1895. Shober went on to become president of the Chicago Bank Note Company. He died sometime shortly after 1900. Rumsey 3034.024. Reps, John, Views and Viewmakers of Urban America (University of Missouri, Columbia, 1984), #1923. Ristow, W., American Maps and Mapmakers: Commercial Cartography in the Nineteenth Century, p. 433-437.